Jerusalem, Israel — July 17, 2016 … Nefesh B’Nefesh, Israel’s respected immigration organization, appears to be making history as they arrange for over 2,000 North Americans to move to Israel this summer. 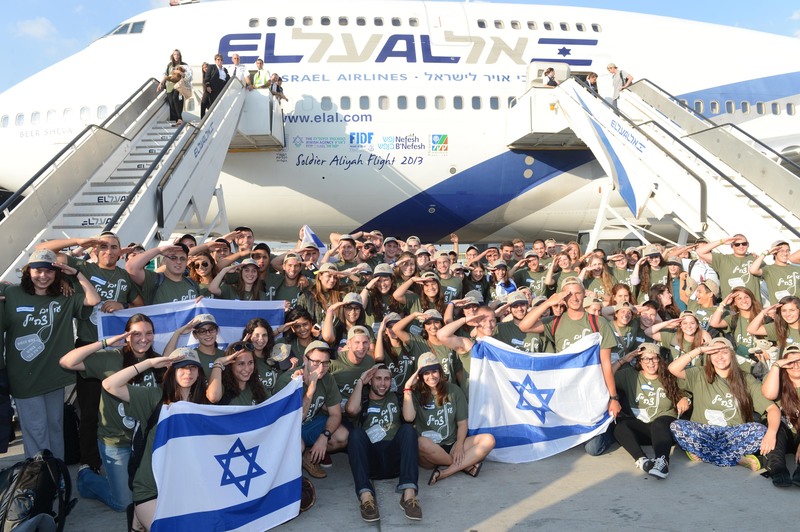 Over 220 North Americans will emigrate from the US and Canada and move to Israel together on a Nefesh B’Nefesh charter Aliyah flight, in cooperation with Israel’s Ministry of Aliyah and Immigrant Absorption, the Jewish Agency for Israel, Keren Kayemeth LeIsrael (KKL) and JNF-USA. The flight will arrive at Ben Gurion Airport, Tel Aviv on Tuesday, July 19, with an eclectic group of immigrants landing together in Israel with Nefesh B’Nefesh, the organization responsible for facilitating the Aliyah (immigration) of nearly 50,000 North American and British Jews in over a decade. The flight’s passengers include a diverse mix of people from 17 states and two Canadian provinces, including former servicemen from three different US Armed Forces units, families of all sizes, young professionals and others. A festive welcoming ceremony will take place for the newcomers at Ben Gurion Airport Terminal 1 (Gate 8) following the flight’s arrival, and is open to the media. Notable guests at the ceremony will include: Minister of Aliyah and Immigrant Absorption, Sofa Landver; Chairman of the Knesset Committee for Immigration, Absorption and Diaspora Affairs, MK Avraham Neguise Chairman of the Jewish Agency for Israel, Natan Sharansky; World Chairman of KKL-JNF, Danny Atar; and Founders of Nefesh B’Nefesh, Rabbi Yehoshua Fass and Tony Gelbart. Founded in 2002, Nefesh B’Nefesh in cooperation with the Israeli government and The Jewish Agency for Israel, is dedicated to revitalizing Aliyah from North America and the UK by removing or minimizing the financial, professional, logistical and social obstacles of Aliyah. The support and comprehensive social services provided by Nefesh B’Nefesh to its almost 50,000 newcomers has ensured that over 90% of its Olim have remained in Israel.